Designed as a Slide Rail Panel Installation Tool, the GME Panel Pusher serves as a way to increase the speed at which a slide rail system is installed. 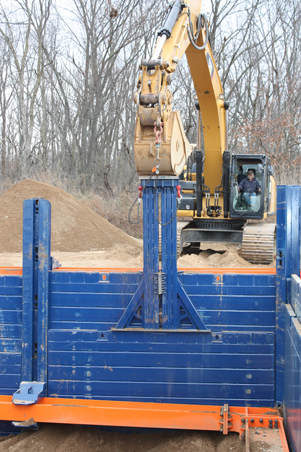 The design of the Panel Pusher reduces wear and tear on Slide Rail Panels (4", 6", and 8" thick) as well as on excavator buckets. Additionally, the Panel Pusher can be used on projects with limited site access, enabling the excavator to reach the Panel Pusher from angles not normally conducive to panel installation. Request additional information here or get a free quote.